Tarsal Tunnel Syndrome (TTS) is a rare compressive neuropathy of the tibial nerve or one of its branches as they pass under the flexor retinaculum. In the TTS literature, the tibial nerve is also referred to as the posterior tibial nerve and TTS is also known as Posterior Tibial Nerve Neuralgia. Some authors  refer to compression of the deep fibular nerve as “anterior tarsal tunnel syndrome”. This page is limited to the discussion of tarsal tunnel syndrome as the entrapment of the posterior tibial nerve or its branches. Incidence is unknown. A higher prevalence is reported for women than men. It can be seen at any age. Many cases (20%-40%) are idiopathic. 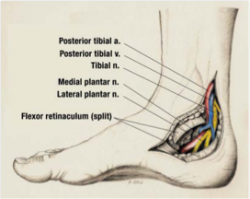 Common symptoms of TTS include paresthesia (burning, numbness or tingling) in the posterior tibial, lateral plantar and/or medial plantar nerve distributions - see picture. Burning, tingling, or pain in the medial portion of the ankle and or plantar aspect of the foot, as well as local tenderness behind the medial malleolus may be seen. Symptoms usually worsen with forced eversion and dorsiflexion of foot. When the medial plantar nerve is affected in isolation patients can present with stabbing pain in the medial sole of the foot upon walking, which is usually seen in middle aged runners. In a progressed or chronic case muscle weakness of the toe abductors and flexors can be demonstrated. In more serious cases muscle atrophy can be seen. Patients can also present with night pain that awakens them from sleep as well as aggravation with prolonged walking. TTS can present similarly to other lower extremity conditions with the most common differential diagnosis being plantar fasciitis as these patients also present with plantar heel pain. In addition to Plantar fasciitis (in which TTS is thought to be commonly misdiagnosed as), polyneuropathy, L5 and S1 nerve root syndromes, Morton metatarsalgia, compartment syndrome of the deep flexor compartment will have to be distinguished from tarsal tunnel syndrome as well. The FAAM is a reliable, responsive, and valid measure of physical function for individuals with a broad range of musculoskeletal disorders of the lower leg, foot, and ankle. Mechanism of injury (MOI) – was there any trauma, strain, or overuse? Duration and location of pain and parathesia? Back or buttock pain associated with more distal symptoms? Pain getting worse, staying the same, or getting better? The presence of an isolated tibial nerve lesion in the tarsal tunnel is confirmed by measurement of the sensory and motor nerve conduction velocity (NCV). 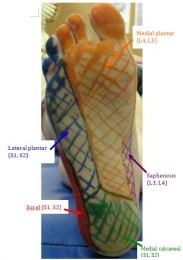 Sensory conduction velocity of the medial and lateral plantar nerves. This is best done by recording from the tibial nerve just above the flexor retinaculum and stimulating the nerves at the vault of the foot. When surface electrodes are used, the responses to stimulation are of low amplitude. Measurement of the motor NCV through recording of the distal motor latency at the abductor hallucis brevis muscle is a much easier, but less sensitive method. The important finding on electromyography (EMG) is the demonstration of axonal injury when the EMG is recorded from the distal muscles supplied by the tibial nerve. Pharmacological treatments are often used in combination with physical therapy management to optimize recovery and decrease functional disability. Surgery is indicated for patients who have not benefited from conservative treatments such as physical therapy and have symptoms that significantly impact their daily life. Individuals with a space occupying lesion tend to not to respond to conservative management and often require surgery. Godges and Klingman have identified several characteristics that have been associated with a successful response to surgery. The charateristics include; younger age, short history of symptoms, no previous history of ankle pathology, early diagnosis, and a determined etiology. and decompression will not be done. There is a lack of high level evidence concerning physical therapy management for tarsal tunnel syndrome. Further research is needed to identify specific rehabilitation exercises for patients with tarsal tunnel syndrome. Small randomized controlled trials would help analyze the effectiveness of specific treatments. One of the mechanical causes of tarsal tunnel syndrome is believed to be excessive calcaneal eversion leading to collapse of the medial longitudinal arch (over pronation) which puts traction stress on the posterior tibial nerve and compression by the flexor retinaculum. Scherer proposes that custom fit orthoses will correct the over pronation and therefore decrease the stress on the posterior tibial nerve. Although there is no clinical outcome studies documenting the effectiveness of orthotics, it may be an important technique to consider when treating patients with tarsal tunnel syndrome. Several articles listed basic techniques for conservative management of tarsal tunnel syndrome as a guideline to rehabilitation, but did not provide patient outcomes. Romani et al reported their findings for a 22 year old male lacrosse player experiencing tarsal tunnel syndrome. The player experienced a mild eversion ankle sprain that was successfully managed with conservative treatment. Upon a second eversion ankle sprain, the patient made an executive decision to participate in the NCAA tournament causing aggravation of symptoms ultimately leading to surgical repair. Within a 13 week rehabiliatation program, treatment consisted of RICE, ROM, balance, theraband exercises, aquatic therapy, and walking which was eventually progressed to running. At the end of 13 weeks, the athlete returned to intercollegiate lacrosse participating at an elite level. For specific postsurgical protocol, click the following link. Dr. Karen Hudes conducted a single subject case study addressing a conservative approach to treating tarsal tunnel syndrome. The 61 year old patient with diagnosed tarsal tunnel syndrome reported pain and discomfort along the medial ankle with a Verbal Rating Scale of 9/10. Initial management included orthotics for the first ten weeks after which the patient reported little to no change in her symptoms. After unsuccessful outcomes with orthotics, treatment techniques such as cross friction massage, HVLA toggle board adjustments of the talonavicular joint, and mobilizations of the cuboid were used twice per week. The patient’s symptoms began to decrease at 3 weeks, resolved by 6 weeks with low pain intermittent recurrences, and completely resolved within 12 weeks. The patient reported no pain at a ten month follow up. There is a lack of high quality research on effective management of tarsal tunnel syndrome. The physical therapist should stage the patient based on swelling, pain, duration of symptoms and/or time since surgery. Management should be impairment based to address specific strength, flexibility, gait and functional limitations of a given patient. ↑ Louisiana State University Health Sciences Center. Posterior Thigh Dissection Guide: Posterior leg - Tarsal tunnel. Available at: http://virtualhumanembryo.lsuhsc.edu/hs2412/laboratory/New_Lab_Guide/LowerLimb/TarsalTunnel.html. Accessed July 5, 2011. ↑ 2.0 2.1 2.2 2.3 2.4 2.5 2.6 2.7 2.8 2.9 Hudes, K. Conservative management of a case of tarsal tunnel syndrome. J can Chiropr Assoc. 2010; 54(2): 100-106. ↑ University Foot and Ankle Institute. Tarsal Tunnel Syndrome. Available at: http://www.footankleinstitute.com/tarsal-tunnel-syndrome. Accessed July 5, 2011. ↑ 4.00 4.01 4.02 4.03 4.04 4.05 4.06 4.07 4.08 4.09 4.10 Antoniadis G, Scheglmann K. Posterior tarsal tunnel syndrome: Diagnosis and treatment. Dtsch Arztebl Int. 2008; 1-5(45): 776-781. ↑ 5.0 5.1 Alshami AM, Babri AS, Souvlis T, Coppieters MW. Strain in the tibial and plantar nerves with foot and ankle movements and the influence of adjacent joint positions. J Applied Biomechanics. 2008; 24: 368-376. ↑ 6.0 6.1 6.2 Moore KL, Dalley AF, Agur AMR. Clinically Oriented Anatomy. 6th ed. Philadelphia, Pa: Lippincott Williams and Wilkins; 2010: 617-618, 666-667. ↑ 7.0 7.1 7.2 National Institute of Health – Office of Rare Disease Research. Tarsal tunnel syndrome. Available at: http://rarediseases.info.nih.gov/GARD/Condition/7733/QnA/21157/Tarsal_tunnel_syndrome.aspx. Accessed on July 5, 2011. ↑ 8.0 8.1 8.2 8.3 8.4 Llanos LF, Vila J, Nunez-Samper M. Clinical symptoms and treatment of the foot and ankle nerve entrapment syndromes. Foot and Ankle Surg. 1999; 5: 211-218. ↑ 9.0 9.1 9.2 Mondelli M, Morana P, Padua L. An electrophysiological severity scale in tarsal tunnel syndrome. Acta Neurol Scand. 2004; 109: 284-289. ↑ Zongzhoa L, Jiansheng Z, Li Z. Anterior tarsal tunnel syndrome. J Bone & Joint Surg. 1991; 73: 470-473. 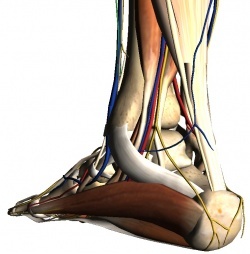 ↑ 11.0 11.1 11.2 Patel AT, Gaines K, Malamut R, Park A, Del Toro DR, Holland N. Usefulness of electrodiagnostic techniques in the evaluation of suspected tarsal tunnel syndrome: An evidence-based review. Muscle and Nerve. 2005; 236-240. ↑ 12.0 12.1 American College of Foot and Ankle Surgeons. Tarsal tunnel syndrome. Available at: http://www.foothealthfacts.org/footankleinfo/tarsal-tunnel-syndrome.htm. Accessed on July 5, 2011. ↑ Toth C, McNeil S, Feasby T. Peripheral nervous system injuries in sport and recreation: A systematic review. Sports Med. 2006; 35(8): 717-738. ↑ 14.0 14.1 Kinoshita M, Okuda R, Morikawa J, Jotoku T, Abe M. The dorsiflexion-eversion test for diagnosis of tarsal tunnel syndrome. Journal of Bone and Joint Surgery, American Volume. December 2001; 83A (12): 1835-1839. ↑ Netter, FH. Atas of Human Anatomy. 5th ed. Philadelphia, Pa: Saunders Elsevier; 2011: 529. ↑ Martin R, Irrgang J, Burdett R, et al. Evidence of Validity for the Foot and Ankle Ability Measure (FAAM). Foot and Ankle International. 2006; 26(11):968-983. ↑ Takakura Y, Kitada C, Sugimoto K, et al. Tarsal Tunnel Syndrome. J Bone Joint Surgery. 1991; 73-B:125-128. ↑ 18.0 18.1 18.2 Huber L, Lombara A. Clinical Review: Tarsal Tunnel Syndrome. Rehabilitation Operations Council: Glendale Adventist Medical Center. October 8, 2010. ↑ Goldstein S. New technologies. Cryosurgery for the treatment of tarsal tunnel syndrom. Podiatry Management. October 2006;25(8):163-170. ↑ Smith S. Acupuncture in the treatment of tarsal tunnel syndrome. Journal of Chinese Medicine. February 2009;(89):19-25. ↑ Godges J, Klingman R. Ankle Nerve Disorder: Tarsal Tunnel Syndrome. Loma Linda University DPT Program. ↑ Bond T, Lundy J. Physical Therapy Following Peripheral Nerve Surgeries. Clinics In Podiatric Medicine and Surgery. 2006;23:651-666. ↑ Scherer P, Waters L, Choate C, et al. 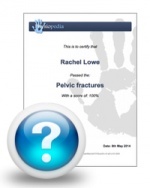 Is There Proof In The Evidence Based Literature That Custom Orthoses Work? Podiatry Management. September 2007;109-122. ↑ 25.0 25.1 Romani W, Perrin D, Whiteley T. Tarsal Tunnel Syndrome: Case Study of a Male Collegiate Athlete. Journal of Sport Rehabilitation. 1997;6:364-370. ↑ Godges J, Klingman R. Tarsal Tunnel Release. Loma Linda University DPT Program.